Positively Intentional will help you start living your life with more joy, energy, love and purpose! Imagine having one place to record all the healthy habits you wish to create along with a plan for finally turning them into a sustainable way of life. An organized, fun workbook that helps you gently move from where you are to where you want to be. Positively Intentional is just that! This 3-month journal gives women the gift of time and space so they can get clear about who they are, what matters most to them and how they can fit more of what brings them joy into each day. Positively Intentional introduces you to the 12 focus areas of Anchored Living–Self-Care (nutrition, stress, sleep and energy), Self-Acceptance (movement, gratitude, positivity and mindfulness) and Self-Expression (connection, communication, spiritualty and service) and provides you with a great way to visualize how well each is working in your life. It features weekly Self-Discovery activities to help you uncover your gifts, talents and passions so you can make decisions in alignment with your highest purpose. It also offers space for recording your weekly intentions and your daily anchors as you easily customize a plan of action that is just right for you. 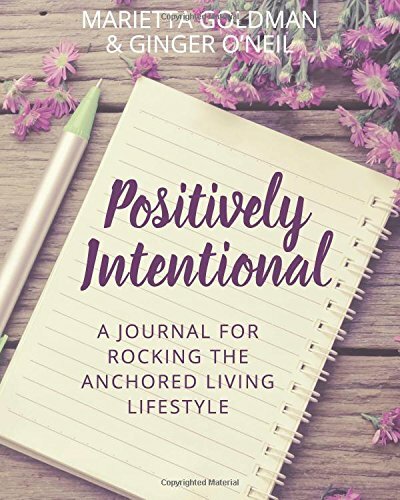 So, if you are ready to begin rocking your own life, grab your copy of Positively Intentional: A Journal for Rocking the Anchored Living Lifestyle today and get started! For a FREE Quiz to help you figure out which of the Anchored Living superpowers you already possess, head on over to www.AnchorsAndAdventures.com.